One of the most frequent questions I am asked by golfers of all abilities, coaches and parents is how to enter the zone or flow state in golf. The profession of sports psychology has different opinions about the ability to enter this highest level of performance. “The best moments in our lives are not the passive, receptive, relaxing times…The best moments usually occur if a person’s body or mind is stretched to its limits in a voluntary effort to accomplish something difficult and worthwhile.” (1990, p. 3). I believe that an athlete can proactively set the stage for entering “Flow” states by utilizing the model Csikszentmihalyi designed. Every moment in practice and competition a golfer has the opportunity to choose where to place their attention. I will provide a more in-depth discussion in the future about how this system is employed so, for now, we will make it simple. Read the rest of the article on womensgolf.com, and feel free to leave a comment or contact me and and let me know what you think. I’m thrilled to share my first article on WomensGolf.com. This will be the beginning of a series addressing issues specific to women golfers. In this article, I discuss the utilization of imagery during the golf swing. Dottie Pepper’s experience is indicative of the importance of imagery. Successful imagery results translates into a “feeling” that is then repeated on successive swings. Stay tuned for more articles on WomensGolf.com, and other outlets directed specifically at women golfers. I had a great time on PGA Tour Radio with my host Michael Breed. A portion of our segment is linked below. I will update everyone when we have future segments so you can tune in! We are filming a 3-episode set that will air on 9/7, 9/14 and 9/21. Be sure to tune in! I’m very proud to share that my client, Ryan Snouffer opened with a 65 in the first round of the Met Open today at Winged Foot. His preparation has been fantastic, and I wish him and all my other clients and friends luck in the remaining rounds. 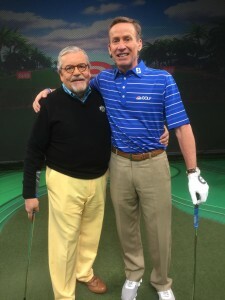 Me & Michael Breed, host of The Golf Fix on the Golf Channel, discussing how to eliminate the yips. It was thrilling to be on The Golf Fix last night with Michael Breed to discuss techniques for reducing anxiety and eliminating the yips. My advice would be to use BRI – Breathing, Relaxation and Imagery. First, breathe in through your nose to inflate your diaphragm, hold, then breathe out through your mouth and pause. It is called “square breathing” because each of the components should have the same rhythm. You will notice that your entire body relaxes on the exhale. This should be done during your pre-shot routine. For imagery, put a picture in your mind of the club impacting the ball perfectly. That should be one of the last things you think before you swing. With that image in your mind, your subconscious will get the club to where it needs to be. This also helps clear your mind of fearing the upcoming shot. Finally, practice as you would play. Use the same pre-shot routine on the range and short game area as you do on the course. This helps train your body and your mind. With effective training, the yips will greatly fade away. Exciting news to share – I will be appearing on The Golf Fix with Michael Breed on Monday, February 9 at 8 pm! Tune in for strategies and tips for improving your mental game.